Two retaining rings, also known as lower anchoring points, may be fitted to each outer rear seat. The following table lists where and how ISOFIX child seats can be fastened at the lower anchoring points on the individual seats in the vehicle according to European Directive ECE-R 16. IL-SU: seat suitable for installing an ISOFIX child seat with semi-universal approval, refer to vehicle list from child seat manufacturer. IUF: seat suitable for installing an ISOFIX child seat with universal approval and securing with top tether. Insert guides can be used to install a child seat with rigid attachments. Insert guides facilitate installation and protect the seat covers. The insert guides in some cases are part of the scope of supply for the child seat or can be obtained from your Volkswagen dealership. If necessary, the insert guides are latched onto the two anchoring points in the vehicle . Observe the child seat manufacturer's instructions when fitting or removing the child seat . Pull the protective caps for the lower anchoring points in the direction of the arrows . Insert the child seat into the retaining rings in the direction of the arrow. The child seat must click securely into place. Pull the attachment belts to ensure that they are equally taut. The child seat must fit snugly to the vehicle seat. In order to avoid permanent marks on the seats, the insert guides should be removed from the anchoring points when there is no child seat fitted to them. 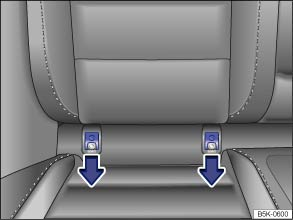 In order to avoid damage to the seat covers, the seats or the insert guides, the insert guides must always be removed from the anchoring points before folding the rear seats forwards. The protective caps should always be attached to the lower anchoring points when no child seat is fitted to the vehicle's anchoring points.